Now those are not the kind of mites that infect cats and dogs. That would be Otodectes cynotis. These were house-dust mites, Dermatophagoides pteronyssinus. Why or how dust mites decided to move into the man’s ear is a bit of a mystery, and the write up provides few clues. However, it’s probably safe to assume that the man didn’t put them there on purpose. Which brings me to a story I heard in the mid-90’s from a veterinarian in New York while he was treating my cat for ear mites. He said there was another vet (he didn’t name him) in a nearby town who had infected himself with Otodectes cynotis intentionally. 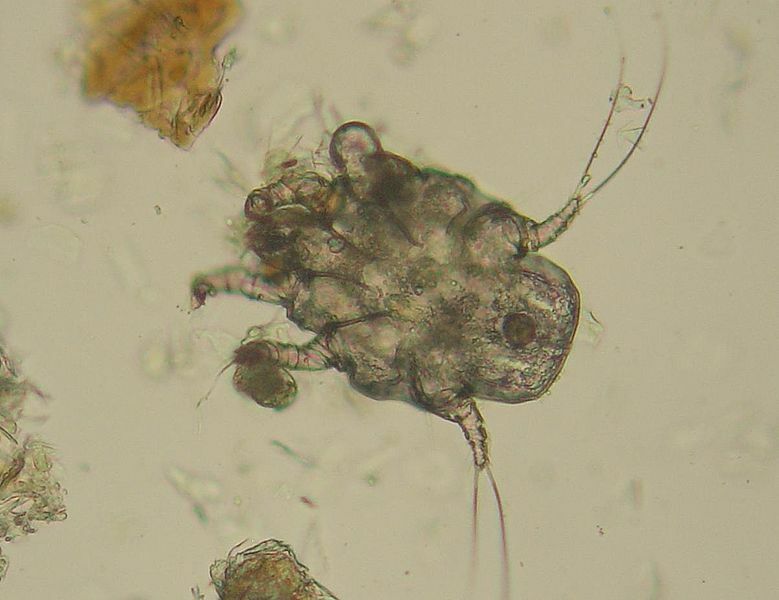 The man apparently wanted to find out if cat ear mites could live in a human ear and he wanted to experience first-hand what such an infection felt like. According to the vet who told me the story, the mites damn nearly drove the guy mad. They itched and kept him up at night with their incessant crawling and scratching as they set up housekeeping inside his ear canal. I had no way to confirm that story at the time but my urban legend alarm went off. I mean really, who would do this? So I put it aside and didn’t think of it much again until a few weeks ago when I was working on a related story. Now, with the internet at my fingertips, I looked it up. Sure enough, it happened. 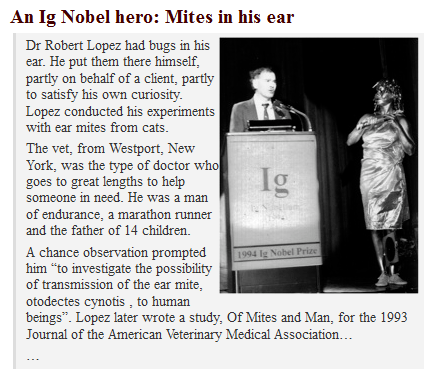 Dr. Robert Lopez of Westport, NY infected himself with ear mites, not once, not twice, but three times, all in the interest of science. In 1993 he wrote up the results for the Journal of the American Veterinary Association. According to Francesca Gould in her book, Why Fish Fart and Other Useless Or Gross Information About the World, Lopez was inspired to become his own guinea pig after treating a cat for ear mites and learning that as the cat recovered, the owner’s 3-year old daughter also recovered from an itchy skin condition. He searched the literature but, at that time (1968) found no reports of humans being infected with Otodectes cynotis. So he took the natural next step and gave himself ear mites. Dr. Lopez wanted to confirm his findings so, a few weeks later, he infected himself again with mites from another cat. The same type of disease developed, although it was less severe and only lasted two weeks. Guess what he did next – he tried again, wanting to see if the reduction in severity might indicate development of immunity. So, he infected himself a third time, with the outcome being milder disease. This suggested to him (logically so) that immunity to the mites might develop, something that fits with the fact that ear mite infestations are more common in young animals. Happily, Dr. Lopez’s work didn’t go unnoticed. He was awarded an igNobel Prize in 1994 for his efforts (and itching). Lopez’s time came on March 12, 2007, at age 85. His lifetime of accomplishments were recounted in his obituary. They included his lengthy veterinary career, his 14 children, his military service, and the 65+ marathons he ran. There was no mention of his igNobel Prize. Several helpful people from AVMA jumped in (Thank you Julie and Diane!) and found me a reprint of Lopez’s original piece. It was actually a “non-refereed letter to the editor.” The letter contains even more creepiness than the excerpts I found online. First, one correction: He did not scoop a gram of ear mites. He scooped a gram of “ear mite exudate.” (either way ewww) In the second test he used a “1-to-2 g sample” from a different cat. This definite reduction in symptoms left many questions. Was there immunity? Were human ears refractory to Otodectes? A third and final trial had to be done. Lopez did learn one thing that maybe only first-hand experience would reveal. That was that the mites had a regular feeding and activity schedule. He found they had two main feeding periods, one in the early evening between 6 and 9pm and a long one in the middle of the night, between midnight and 3am. Daytime activity was brief and infrequent. Based on this finding, he began advising pet owners to administer ear medication for mites late in the evening. Practicing Otology of Kyoto 1991; 84: 38–42. Lopez, R. A. 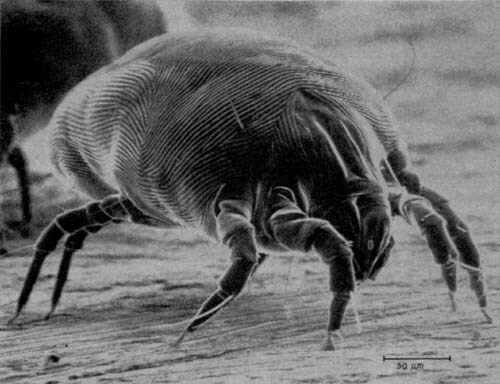 (1993) Of Mites and Man. Journal of the American Veterinary Medical Association 203 (5), pp. 606–607. PreviousFrom Blogger to Book Author: How do you do that? Bravo and thank you for sharing this obscure piece of science. As you pointed out it does rank as an urban legend until you burrow deeper into it. I’m confident will have your followers are itching to know more as you scratch out the next installment. Mite it be a good one I hope? Maybe it’s me but your post leaves me scratching my head (ears, and miscellanceous anatomical parts). Meanwhile I need to find some Q-tips. I actually use this article in a course in “science methods” for students in a teacher education program…..I get them to discuss “Is this ‘science’?” and considerable conversations occur. That’s a great idea Mike. I imagine it does launch quite a discussion! Thanks for stopping by. 00% organic, raw honey works the best in treating ear mites. This is due to the presence of antiseptic & antibacterial properties. However, the active compounds in honey that do the job are hydrogen peroxide, phenolic & dicarbonyl compounds. An anti-inflammatory, purifier, and astringent properties of yellow dock herb can cure the ear mites in cats.